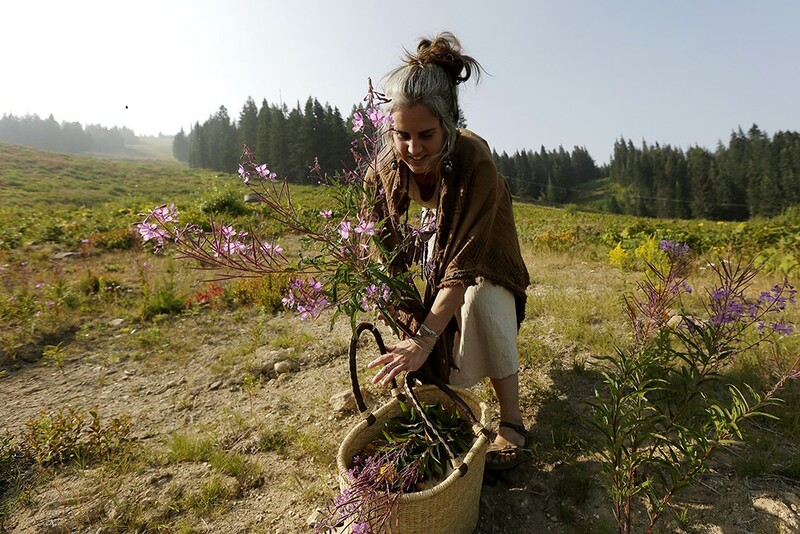 Aubrey Mundell, the Wandering Lemurian, harvests fireweed at Mount Spokane. An untrained eye would have overlooked the cluster of silvery green leaves poking up through a pile of smooth rocks on the banks of the Spokane River. But wild plant forager Aubrey Mundell immediately spots the herb, a variety of mugwort, traditionally used to soothe the stomach, aid digestion and even to treat menstrual problems. Many other edible and medicinal plants naturally grow along the banks of the Spokane River below Kendall Yards, and even along the Centennial Trail above. During a walk through the neighborhood on a hot, dry August day, the self-trained forager points out a handful of plants that can be cooked or eaten raw, dried and steeped into teas, or used as smoking herbs. Though it's extremely invasive and classified as a noxious weed in Washington and many other states, Japanese knotweed's young spring shoots can be harvested and prepared a number of ways; even pickled. So can the immature leaves of red dock, a plant of the genus Rumex that's commonly found growing along roadsides and by late summer is several feet high with a stalk topped by feathery, burnt red sprays of seeds. Cattails are also edible throughout the growing stage, from the plant's stem to its pollen. Black hawthorn berries, which Mundell spots growing on thorny trees along the river, can be dried and used in teas, as can wild rosehips. Western salsify, another common weed in urban environments, can be harvested for its long, edible taproots. Locals may recognize the plant by its small yellow flowers that bloom atop a long stem and transform into large fluffy seed heads resembling a dandelion's. "That one grows all over my backyard. I pick that and cook it and eat it. My neighbor is always like 'What are you gathering over there?' and she's offered to spray my yard" for weeds, says Mundell, a soft spoken woman with long brown hair that's faded to silver at the roots. Rather than her given name, Aubrey, Mundell prefers to be called Haseya — of Navajo origins, that means "she rises." "I was really surprised how many [plants] grow in my backyard or my neighborhood where I can walk and gather things," Mundell continues. Fresh thimbleberries from the mountain. Mundell has turned her love of nature and the many wild, edible plants it provides into her Spokane-based business Wandering Lemurian Herbs, through which she hosts wild foraging classes several times a year — mostly in the spring and fall — and also sells herbal tea blends and other products. Some of these teas, infused honey spreads and other products, including her popular "Forest Faerie Sprinkles," made from dried, crushed flower petals, are stocked by the Pop Up Shop in downtown Spokane at the Steam Plant. Wandering Lemurian's line of herbal products is also sold through her website. While growing up in Arizona, Mundell fondly recalls her mother, Carol, using medicinal herbs and sharing naturopathic healing and spiritual practices with the family. Mundell's interest in foraging wild plants, however, didn't blossom until after moving to Spokane about six years ago. "First I got really interested in the wildflowers and wondering what was edible and what wasn't," she recalls, adding that she and a friend became curious about wild plants during frequent hikes around the region. "We started photographing and researching, and bit by bit we started understanding which plants were edible and the characteristics between them, and that has evolved over the past six years." Wandering Lemurian Herbs is currently a side project for Mundell, who also works as a server at a local restaurant, though she hopes to gradually grow the venture as time and interest from her customers allow. At the peak of another dry summer in the Inland Northwest, there's not much still growing at lower elevations that can be harvested and eaten. Spring and early summer are the region's most bountiful seasons for harvesting wild, edible plants. Come fall, there will be wild roots to dig. Up on Mount Spokane, however, Mundell is able to easily find huge swaths of fireweed, a tall-stemmed plant bearing bright purple-pink blossoms that can be consumed at many stages of growth, including its flowers. "The reason I wanted to connect back to the earth is because I was getting sick from foods I was eating," explains the practicing vegetarian. "These natural nutrients our ancestors were able to live off of was really appealing." When she's out gathering in the forests and fields, Mundell is mindful of ethical foraging practices, which means leaving enough plants behind to ensure future propagation. In addition to gathering what she can from wild environments, Mundell tends a small herb garden at her North Spokane home, where she grows calendula, lavender, skullcap, hyssop, lemon balm, St. John's wort, feverfew, wild strawberry and some vegetables. Most of the wild plants Mundell gathers she eats fresh alongside everyday foods in her mostly plant-based diet. Depending on the plant, she'll boil, pan fry or consume raw. 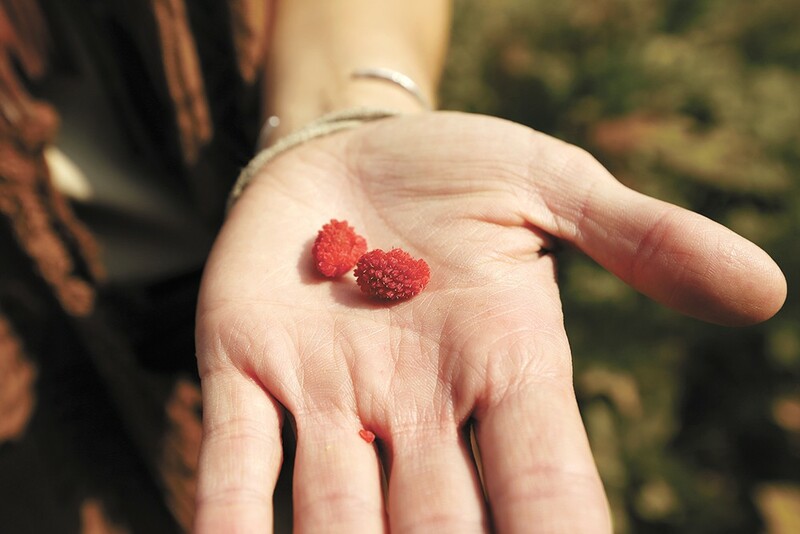 "A goal I made myself is to eat some form of wild food every day, even if it's something from my backyard," she says. Find more about Wandering Lemurian Herbs at wanderinglemurianherbs.com. The original print version of this article was headlined "Nature's Bounty"
Sat., April 27, 7-8:30 p.m.